This is the boring bit where we need to explain the legal points that apply when you access our website. These are cookies set on your device by external websites whose services are used on this site. Cookies of this type are the sharing buttons across the site allow visitors to share content onto social networks. Cookies are currently set by Amazon, Facebook and Twitter. In order to implement these buttons, and connect them to the relevant social networks and external sites, there are scripts from domains outside of our website. You should be aware that these sites are likely to be collecting information about what you are doing all around the internet, including on this website. Your access to the Radio Sunderland Web site is subject to the following terms and conditions, which take effect on the date you first access the Radio Sunderland Web Site. By accessing the Radio Sunderland Web Site you agree to such terms and conditions without any qualification. If you do not agree to them then you do not have permission to access the Radio Sunderland Web Site and you should not enter the Radio Sunderland Web Site. All rights (including copyright, database rights and other intellectual property rights) in the Radio Sunderland Web Site are the property of or licensed to Radio Sunderland at all times. All material contained on the Radio Sunderland Web Site including text, images, graphics, trademarks, logos, service marks and personal likenesses is proprietary or copyright material and unless otherwise specified may not be copied, reproduced, downloaded, posted, transmitted, distributed, stored in any medium (including on any other web site) or interfered with in any way except that you may however download a single copy of material displayed on the Radio Sunderland Web Site on your home computer for non-commercial, personal use only provided that you retain all copyrights, credits and other notices contained on the material. You will not modify such material or use it for any other purpose. Radio Sunderland will use its reasonable endeavours to monitor and review the discussion, chat, postings, transmissions and other dialogue on the Radio Sunderland Web Site periodically and generally to follow best practice. Radio Sunderland, however, is not capable of monitoring all such material continuously and the Radio Sunderland Web Site and its contents are provided on an "AS IS" basis. Radio Sunderland shall not have and hereby expressly disclaims so far as may be permitted by law all responsibility and liability whatsoever (including liability for any damages such as, without limitation, indirect or consequential damages or any damages whatsoever arising from use of or in connection with use of the Radio Sunderland Web Site) for any error, inaccuracy, misrepresentation, defamation, omission, falsehood, obscenity, profanity, pornographic material, dangerous material or any other material contained within its Web Site. Radio Sunderland does not warrant that the functions contained in its Web Site will be uninterrupted or error free, that any defects will be corrected, or that its Web Site or the server that makes it available are free of viruses. Radio Sunderland does not represent the full functionality accuracy or reliability of such material. Furthermore, Radio Sunderland does not review or monitor the content of any off-site pages or any other sites linked to the Radio Sunderland Web Site and assumes no liability for and shall have no responsibility for any of the content thereof (including, without limitation, any sale or transaction undertaken on such off-site pages). :: disrupt the Radio Sunderland Web Site by, for example, making the screen scroll too quickly for other subscribers to type their messages, or suddenly changing the subject matter in order to stop the flow of dialogue. Radio Sunderland reserves the right to terminate your access to its Web Site immediately and may take legal action against you if you breach these rules for online conduct. You agree not to act or rely upon any information or material contained on the Radio Sunderland Web Site, which is provided by Radio Sunderland for your general interest and entertainment only. Radio Sunderland shall not have and hereby expressly disclaims so far as may be permitted by law all liability arising from your reliance upon such information of any nature whether direct or indirect. Any information or data you transmit or post on the Radio Sunderland Web Site will be non-confidential and shall belong absolutely to Radio Sunderland and may be used by Radio Sunderland for any purpose including without limitation for reproduction, disclosure to third parties, broadcasting, transmission, posting or otherwise at Radio Sunderland's absolute discretion, and in consideration of Radio Sunderland permitting your access to its Web Site and for other good and valuable consideration the sufficiency of which you hereby acknowledge, you hereby assign to Radio Sunderland by way of present assignment of present and future copyright all rights of any nature in and to such material throughout the world in perpetuity including all renewals and reversions thereof. You agree to indemnify and keep Radio Sunderland indemnified from and against any and all claims, damages, expenses, costs and liabilities arising in any manner from your entry to and use of the Radio Sunderland Web Site other than in accordance with these terms and conditions. Radio Sunderland may periodically update and revise these terms and conditions and you agree to be bound by such revisions and should therefore revisit this page periodically to acquaint yourself with such. Radio Sunderland accepts no obligation to maintain or update the Radio Sunderland Web Site and does not represent or warrant that the information accessible within its Web Site is accurate, complete, or up to date. If any of these terms and conditions should be determined to be illegal, invalid or unenforceable such term or condition shall to the extent required be severed from these terms and conditions and rendered ineffective, as far as possible without modifying the remaining provisions of these terms and conditions. These terms and conditions shall be governed by and construed in accordance with the laws of England & Wales. Radio Sunderland for Hospitals is committed to protecting your privacy and data. We will use the information that we collect about you in accordance with the General Data Protection Regulation 2018 and the Privacy and Electronic Communications Regulations 2003. 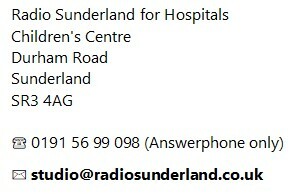 Radio Sunderland for Hospitals is a registered charity. We receive no ongoing revenue funding. Our income comes from individual donations and fundraising activities. We are an independent Charity Registered in England and Wales number 1073012. Your activities and involvement with us will result in personal data being created. This could include details of applications for membership, how you’ve helped us by volunteering or supporting us. If you decide to donate to us then we’ll keep records of when and how much you give. :: respond effectively to enquirers and handle any complaints. If you’re a volunteer then we may collect extra information about you (e.g. references, criminal records checks, details of emergency contacts, medical conditions etc.). This information will be retained for legal or contractual reasons, to protect us (including in the event of an insurance or legal claim) and for safeguarding purposes. Your data will not be shared with third parties, unless we need to disclose your details as required by the police, regulatory bodies or legal advisors. All Radio Sunderland Trustees, members and volunteers have some responsibility for ensuring data is collected, stored and handled appropriately. The Trustees are ultimately responsible for ensuring Radio Sunderland for Hospitals handles personal data in line with this policy and the data protection law. The only people that should have access to data covered by this policy, should need it for the everyday running of the station. :: Data should not be shared informally. :: When access to data is required, it should be only given on the understanding that it can only be used for reasons that comply with this policy. :: Personal data should not be disclosed to unauthorised people, either within the organisation or externally. :: Data should be regularly reviewed and updated if it is found to be out of date. :: If no longer required, it should be deleted and disposed of. :: When data is stored on paper it should be kept in a secure place where unauthorised people cannot see it. :: When data is stored electronically, it must be protected from unauthorised access, accidental deletion and malicious hacking attempts. :: Ask what information the organisation holds about them and why. :: Ask how to gain access to it. :: Be informed on how to keep it up to date. :: Be informed how the organisation is meeting its data protection obligations. If an individual contacts the organisation requesting this information, this is called a subject access request. These requests can be made to any of the Trustees preferably in writing and the requested information must be provided within 28 days. It is up to the Trustee to verify the identity of the person who is making the request. Under these circumstances, Radio Sunderland for Hospitals will disclose requested data, after checking that the request is legitimate. Scan the QR code to capture our telephone number and email address.